Lonnie Chisenhall has been very good at hitting baseballs. 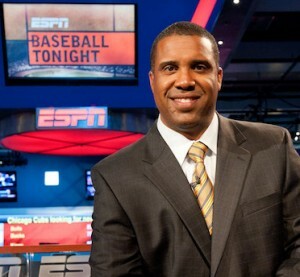 Whether he is good at hitting baseballs (i.e. : whether ‘being good at hitting baseballs’ defines his physis) is very slightly more debatable, but we have statistics that tell us that Lonnie has been, since the start of the season, good at hitting. His .451 wOBA, his .385 batting average, his wRC+ of 195 – all of these statistics are important, central in asserting the controversial claim that Lonnie is kinda good at this. But there comes a time during the adolescent years of Microsoft Excel 2000 (it’s already 15!) when they tire of computing real and important stats like xFIP and instead take to computing frivolous and useless stats. Judging by the Avenged Sevenfold blaring from my Excel 2000 (? ), it seems that, like any other teenager, it has created a tremendously stupid statistic. Fielding-Independent Pitching, or FIP, is unambiguously a very useful stat. Given how many strikeouts, walks, and home runs a pitcher has allowed, it tells a complete narrative of what that pitcher’s ERA should look like given a reasonable defense behind that same pitcher. It’s not the most useful pitching predictor – that would go to either SIERA, kwERA, or xFIP – but it’s good at explaining what the pitcher, rather than the defense (or to a lesser degree, the batter) did right or wrong. FIP is better than Game Score, and sure as hell better than WHIP or any other new HyperCalvinist metrics that, with all the farcical self-importance of a Congressional session, believe that raw hits allowed are substantially influenced by the pitcher beyond strikeout rates. Categories: Indians News | Permalink. This column is merely a short and simple assembly of stats, observations and preponderances from the past week as well as what is just around the corner. The Indians as of noon Sunday sit at eighth in Major League Baseball in runs scored, and fifth in the American League, which may be relatively shocking to those who watch the Indians with regularity. As well the Indians offense is generally underrated because of both things it does well being under-appreciated and things it does poorly being overvalued. Which leads us to OBP and lineup depth. The Indians are 4th in MLB in OBP at .330 as a team, third in the American League behind Oakland and Toronto both regarded as elite offenses this season. OBP is essential to run scoring for the Indians as they lack a traditional “anchor” level middle of the order. Of course these anchor types are becoming increasingly scarce as offense has declined over the past five years, unfortunately the general baseball watching population has not picked up on the decline. The other general assumption is that in order to have a good offense it needs to be anchored by a 30-100 guy. This is simply not the case as the Tribe’s production shows. Indeed the Indians front office deserves immense credit for the cost effective offense which they have created. The Indians have focused on OBP ability in general when considering the construction of its lineup as well as the blessing of development for a few specific players. Swisher and Murphy were two low and mid-level free agents, each adding length and on base ability to the lineup. Though Bourn, and utility guy Mike Aviles underwhelm on occasion with OBP, their cost-value gap allowed the Indians to break the model. Of the Indians with 100 plate appearances Carlos Santana is fifth on the team with a .342 OBP, absurd. Santana’s Major League best 20.2% walk rate is has allowed him to remain a valuable offensive player despite a batting average hurt by BABIP issues. Worth adding is that Santana looked absolutely phenomenal on Saturday having his usual quota of high quality of at bats as well as squaring up strikes when they got too much of the plate. On Justin Masterson and velocity. A lot has been made of Masterson’s decreasing fastball velocity and its overarching effects on his ability to pitch efficiently and productively. So I grabbed a handy little velo chart to take a quick and relatively vague look at it as a potential issue. Obviously pitch velocity is down but perhaps not as drastically as we have been led to believe over the past month, which has a occurred for a few reasons. First people have been comparing his early season velocity to last years full season velocity. What is most clear is that his velocity generally increases in the early months and the flatlines with negligible movement to either side of the mean for the remainder of the season. Secondly, on his most used offering the sinker or two-seamer the velocity decrease is not nearly as drastic of a differential. 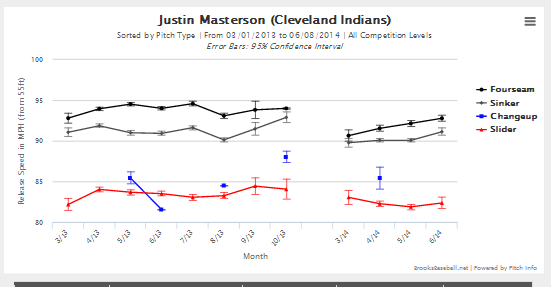 In fact, in June of 2013 Masterson’s sinker was at 90.92, in his one June start in 2014 it was at 91.12. In May 2014, it was a little more than 1/2 a MPH slower than 2013, which is a relatively minimal difference. Obviously velocity has been an issue for Masterson but it has become overplayed, hiding the other issues which face him. Th first issue being he is a ground ball pitcher in front of the worst infield defense in baseball; the second being control issues which spot up for him from time to time. Categories: Cleveland Indians, Indians News | Tags: Cleveland Indians, Danny Salazar, Mickey Callaway, Ubaldo Jimenez | Permalink. College Football statistics concern themselves with the realm of the past; they tell the story of what was with very little ability to project what will happen. Were one to use CFB statistics to forecast the future, one would conclude that Case Keenum was the most toolsy QB in history and that Ron Dayne would go on to run rampant over a National Football League unprepared for his Achillean might. College Football stats are the Herodotus of scouting: they chronicle what has happened, aren’t much concerned with what will, and they have a very tenuous relationship with a certain mistress named Truth. If CFB stats are Herodotus, then game film and scouting might be called College Football’s Thucydides. The tale of the tape confronts us with past performances, and while it is incumbent upon the reader to determine what this means for the future, one can glean a much more complete narrative – how good or poor a QB’s footwork is, how accurate their throws are, whether they’re playing behind an offensive line that weighs a total of 750 pounds. The tape provided us with a conflicting narrative for Johnny Manziel – a QB with abysmal footwork but core strength that resulted in rather good arm strength. If his leg drive were better/existant at A&M, his arm strength might have received a much higher projection. Manziel, it seems, has thrown a football from Berea, OH all the way to Cameroon, Africa. Directly east of Nigeria, Cameroon seems like a very strange target for Johnny Manziel to throw to. As of yet, reports are unclear whether Manziel intended to throw the ball to Cameroon, or whether he was aiming for Nigeria and overshot. While the accuracy issues pose a question, it remains clear that Johnny Manziel now has the single strongest arm in the league – a terrifying prospect both by virtue of his now boundless potential, but also because of the grave, grave health threat now posed to his receivers. If Manziel feels compelled to throw between defenders, the zip he could put on the ball would pose a certain prospect of death or dismemberment to any receivers targeted. Even before Manziel’s Mach-24 performance, his NFL prospects were divisive, and the question arose whether he was more concerned about his branding than his performance. This literal salvo to the African market is sure to only increase that polarization in the upcoming months. Categories: Cleveland Browns | Tags: Case Keenum, Cleveland Browns, Johnny Manziel, Nonsense, Ron Dayne | Permalink. It boggles comprehension how far from favor quillmanship has fallen. Once upon a Freer America, skill with the quill was the mark of a refined gentleman, and ‘beautiful prose’ once entailed aesthetics in the writing. Nowadays, in today’s frivolous insta-Frappucappucino, I-Want-It-All (and I want it now! ), Heisenberg’s Uncertain Principles world, any meandering dullard can push out a thousand words with a BIC. Gone are the days when a fountain pen’s artisan keystrokes festooned a blog. I – I alone! – fight the terrible and necessary fight against eroding morals, striking each key not with ball-point hedonism but with the measured care of the fountain pen. Categories: Cleveland Browns | Tags: Deluded Ralph, Johnny Manziel, Nonsense | Permalink. It’s still kind of surprising to me that I bought one of these things. It’s embarrassing, really, that I’m buying a book just to let out my feelings. I feel really stupid. Have you ever lost someone close to you? Not, like, they died or anything. Just – have you seen someone you used to be good friends with drift away? It wasn’t as though they were my closest friend in the world – what Andrelton and I had was – we were really close. But I’m not trying to make a friendship-ranking here; I’m not Buzzfeed and friendships aren’t listicles. I just want to let the Cleveland outfield know that I miss them. Categories: Indians News | Tags: Cleveland Indians, David Murphy, Michael Bourn, Michael Brantley, Ryan Raburn | Permalink. Entering the season, Carlos Carrasco’s strikeout rate posed something of a conundrum. Carrasco’s ‘stuff’ going into the year was very good – put less interestingly, his pitch mix induced a swinging rate that was average to above-average for starters. Typically, the meme for minor-leaguers is that they have good-looking pitches but that those pitches don’t translate to whiffs. This was the explanation reflexively thrown out there for Carrasco, despite the fact that his pitches did translate to whiffs. The gap, then, was the dissonance between Carrasco’s Swinging Strike rate and his strikeout rate – in other words, the approach was good, but the results did not follow. Categories: Indians News | Tags: Carlos Carrasco, Cleveland Indians, Corey Kluber, Danny Salazar, Justin Masterson, Zach McAllister | Permalink. It is in response to momentous events in our lives that we fashion ourselves anew. A distant father’s death might prompt a son to imitate his father, becoming himself more distant. A cancer diagnosis prompt one to begin cooking crystal meth with a former student, and a viewing of Japanese art production Naruto might prompt high school students to comport themselves as ninjas. Carlos Santana appears to have experienced just such a momentous event. In the top of the seventh inning in Friday’s game against the Baltimore Orioles, Carlos Santana hit a two-run home run, and he responded to this event in predictable fashion. In response to catching a Big Fly, you see, Carlos Santana has become a frog. Categories: Indians News | Tags: Carlos Santana, Cleveland Indians | Permalink. When Asdrubal Cabrera signed a contract extension with the Cleveland Indians in 2012, Manny Acta (rightly) described Cabrera as having “carried the offense“ in 2011. Fresh off a 25-home run season in which he was the third-best offensive shortstop in baseball, Asdrubal Cabrera’s value was at its zenith. In a sense, it was the worst time for the Indians to sign him. Fast forward only two years later to April 2014, the two-year, $16.5 million contract set to pay Cabrera $10 million this year is less unambiguously well-received – in much the same sense as John Elway is not unanimously beloved by Browns fans, or in the same sense as LeBron James in 2011 was slightly less Playing For The Cavaliers. Even in the best of times, Cleveland commits to shunning The Astrocab. His contract is perhaps one of the largest contributing factors to the great heap of disdain. After a 2013 season in which he posted subpar offensive numbers, coupled with the worst shortstop defense in the league, demands for top prospect Francisco Lindor mounted, both locally and nationally, only adding to enmity toward the shortstop – not only was he objectively below-average, he was perceived as the force holding back the best cornerstone shortstop prospect in the game. Given that, bitterness swelled at the idea of giving $10 million to the below-average Asdrubal Cabrera. Categories: Cleveland Indians, Indians News | Tags: Asdrubal Cabrera, Contract Extensions, Grady Sizemore, Jason Kipnis, Manny Acta, Michael Brantley, Stephen Drew, Travis Hafner, Yan Gomes | Permalink. Categories: Indians News | Tags: Cleveland Indians, Corey Kluber, Detroit Tigers | Permalink.